It is just beautiful and received sooo many compliments!! Sweatshirt embroidery was excellent but the sweatshirt size was between a medium and small. I gave it to someone who wears the smaller size. 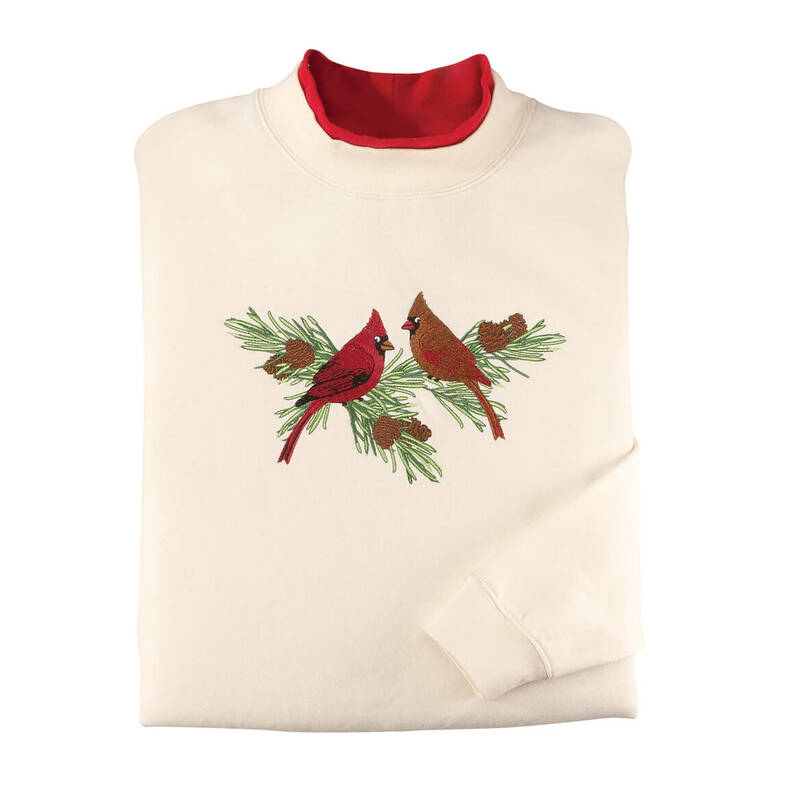 My mother loves cardinals and this sweatshirt will be perfect for her. I like cardinals and I thought it was a pretty sweatshirt. I always need sweatshirts and thought it was cute for the holidays. To wear in cold weather, I also like the cardinals on the front. Looks dressy and my mom loves these sweaters that have the dual color collars. Friend loves cardinals, got it for her birthday. Beauty sweatshirt. 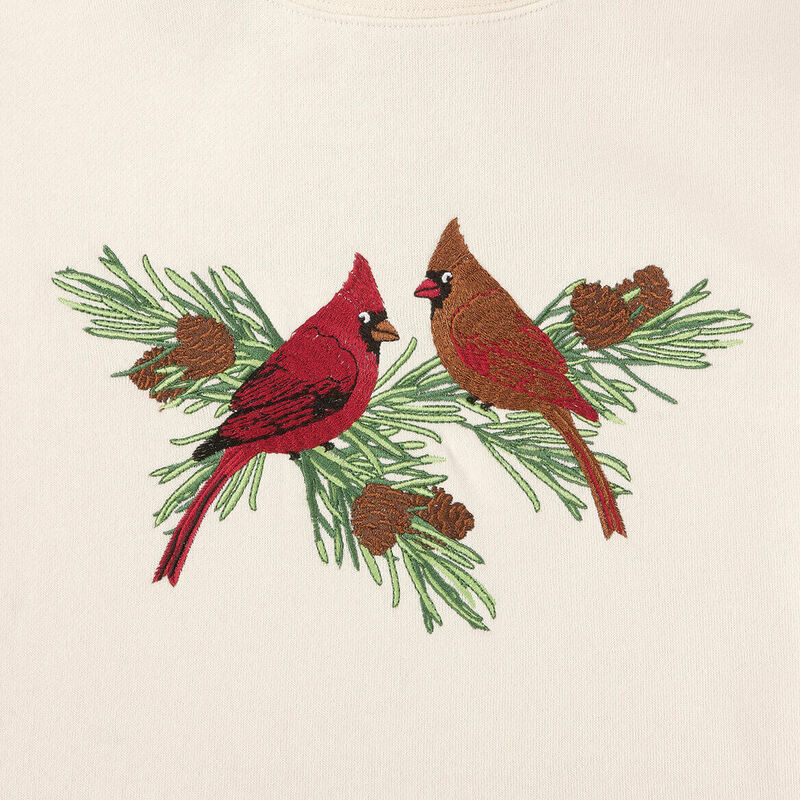 my Mother in law loves these layered sweatshirts and Cardinals. I needed a few warm tops for the winter and I liked this scene. I love nature and the details! Love the idea that Cardinals are reminders of loved ones that once shared Christmas joy with us! Perfect for my elderly mother-in-law at assisted living to help keep her warm where she doesn't do much physical activity. The color is pleasant and pretty enough to perk up most anyone on a cold winter's day. Her favorite is cardinals and this is beautiful. Again, Cardinals remind me of my Husband's love, since his passing. BEST ANSWER: Yes,the pattern is embroidered. I think it is a great sweatshirt for someone who likes cardinals. I was really happy with it!